Matt Brown is a former Penn State wrestler. On January 15, 2016, the NCAA honored him as with one of the “Today’s Top 10” awards. The award recognizes achievements in competition, academics, and community service. 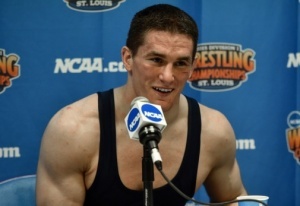 Brown also took a national title in the 2015 NCAA finals. Brown wrote Mission: Accomplished, Reflections of an NCAA Champion. In the book he talks about what wrestling taught him. He also includes lessons from his proselyting mission to Mozambique and Angola for The Church of Jesus Christ of Latter-day Saints, which he served from 2009 to 2011. Soon after his return, he baptized his friend Lauren, and they married in 2012. He was born in Utah and started to wrestle at the age of four. He joined Treehouse Athletic Club and during high school, he earned three Utah state titles. After high school, he considered going to West Point (he had earned an appointment from his congressman), but after a stop to visit Iowa State and meet head coach Cael Sanderson, Brown decided to attend Iowa State. When Sanderson accepted the head coach position at Penn State, Brown went with him. In his book, Brown shares the principles of success he learned from Sanderson and others. Brown earned both his bachelor’s and master’s degrees from Penn State. This page was last edited on 25 May 2016, at 11:34.